Click HERE to open a new Window with a really big enlargement. Click on the enlargement to magnify it to full size. Kim is an award winning quiltmaker from Australia who features imaginative use of Kaffe's fabrics in her quilts. We have been huge fans of her work for sometime. and are so pleased that Glorious Color is able introduce another of Kim's glorious applique patterns, to you. 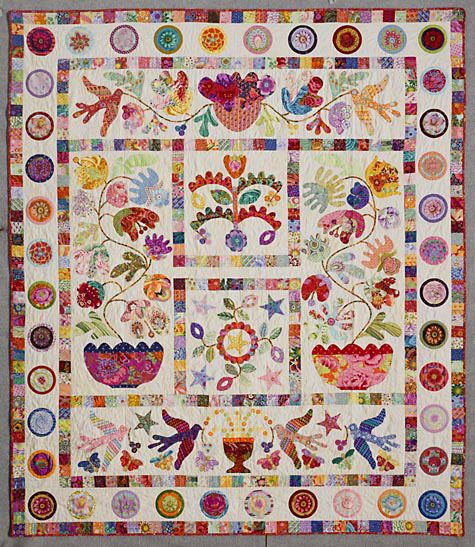 The Flower Pots Quilt shown was designed by Kim and made by Sue Belzacki. The Starter Fabric Pack: A few of Kaffe'sfabrics in the original quilt have been discontinued, so we included as many of the original fabrics as we could and, with Kim's guidance, augmented them with new Kaffe fabrics. We have bundled Kaffe's fabric in enough variety to do most of the applique, sashing and borders. Some of the original fabrics weren't Kaffe's designs, so we encourage you to add your scraps to the design for added variety. The fabric pack does not include the background fabric or pattern. The Background: The original Flower Pot used a single background fabric. We suggest using one of Kaffe's Spots or Aboriginal Dots fabrics for the background. We recommend six yards of fabric for the complete background. The Pattern: The pattern for the entire quilt is available in a single package. It is printed in 1:1 scale. There is no need to enlarge the pattern. We have appliqué needles and silk thread in a wide range of colors are available HERE. Pattern notes: The three sashing strips shown in the center of the Layout Diagram should each be labeled 22" x 2" (not 18" x 2"). They are labeled correctly in other parts of the pattern. Patterns purchased more recently may already have this correction. This fabric pack contains more than 14 yards of fabric. Most of the fabrics in the original are no longer available as this quilt was made many years ago. We have put together a good range of similar fabrics in this starter pack. When possible we have included the original fabrics. It is likely that you will not have enough fabric in the pack to do all the applique pieces if you do a lot of "fussy cutting". Add fabrics from your stash to make the quilt unique to you. The finished quilt is approximately 78" x 90". The fabric pack does not include the background fabric or the paper pattern.